One essential thing we must teach our dogs is to eliminate in the appropriate place. We need to teach our dogs to go to the bathroom only outside, and to hold it until he is allowed outside. When you first start to tackle potty training, you must first be aware of a few key factors. Puppies: The average puppy does not have the capacity in his bladder to “hold” all his urine until he is about 4-5 months of age. The same goes for his mind to control the urge of going potty when he feels the stress of his bladder when getting full. Around seven months is typically when their bladder is developed at full size. When you take your puppy out to eliminate, you will need to stay with him. When he goes to the bathroom outside, you must let him know he is being a good boy, by praising him and giving him a healthy dog treat. This must take place where he is going potty, not after he comes inside. You can introduce your potty word by saying “go potty” just as he’s about to go. After he finishes, tell him how good he is, and give him his tasty dog treat and some love. After you have praised your puppy for going potty outside, DO NOT TAKE HIM BACK IN THE HOUSE! This will only cause your puppy to delay going potty because he doesn’t want to go back inside. Instead, play a quick little game with your puppy outside. One exception, of course, is if HE wants to go back inside. Supervision: You must watch your puppy very closely. You may even want to attach him to you by a leash clipped to your belt or chair, or held under your foot. This way he can never just disappear and get into mischief. When you are not able to keep a constant eye on him, a wise idea is to confine your puppy to a small area or a dog crate (click to learn how to train your dog to like his crate or kennel). Most dogs do not like to eliminate in the same area they lie in. Preventing mistakes is the best tool in training. Use it consistently. Accidents: Catching a potty mistake is not the end of the world. Remember they are puppies, and accidents will happen. What you do when this happens is very important. When you CATCH your puppy in the act, calmly say NO, scoop him up and rush him outside. If he finishes eliminating outside, praise him for eliminating in the right spot. Do not reprimand your puppy for eliminating in the house if you did not see the crime. It’s too late. They do not understand what they are being punished for. Rubbing their nose in it only confuses them. Instead, put him in his crate, and clean up the mess. Clean Up: You must remove the odor completely, or your puppy will think that is the appropriate place to eliminate. Don’t use vinegar or cleaners containing ammonia. These will only attract your puppy back to the spot. Instead, use an enzymatic cleaner. Baking soda or club soda will also neutralize the odor. Adult Dogs: The first thing you want to ask yourself is if soiling in the house is a new behavior. If your dog suddenly starts to soil inside, you should first seek a veterinarian. Your dog may have a physical problem such as diabetes, Cushing’s, colitis, pancreatitis, urinary tract infection, kidney disease, or urinary incontinence. Certain medications also can increase urination. 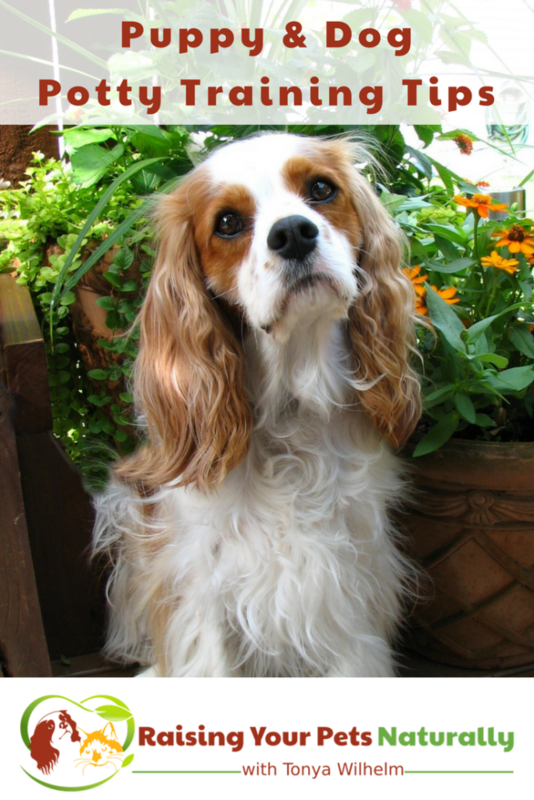 After ruling out any medical conditions, it’s time to look at your dog’s environment. This may be more of a behavior issue, and you should seek professional advice from a qualified dog counselor or applied animal behaviorist. 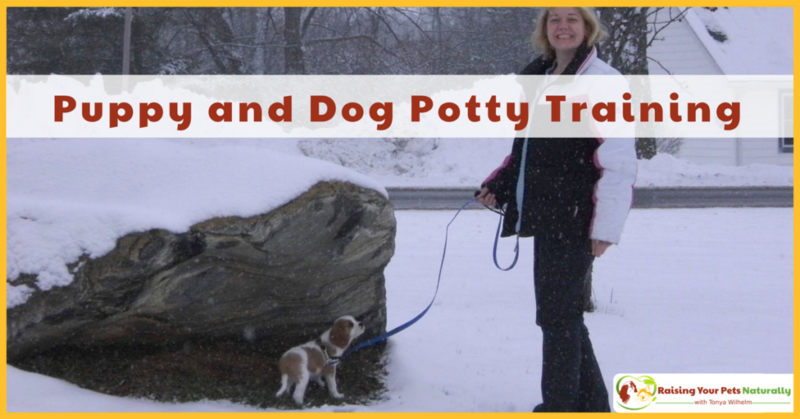 If you are adopting an adult dog, you should treat it like a puppy, and follow the guidelines for potty training in the same fashion. 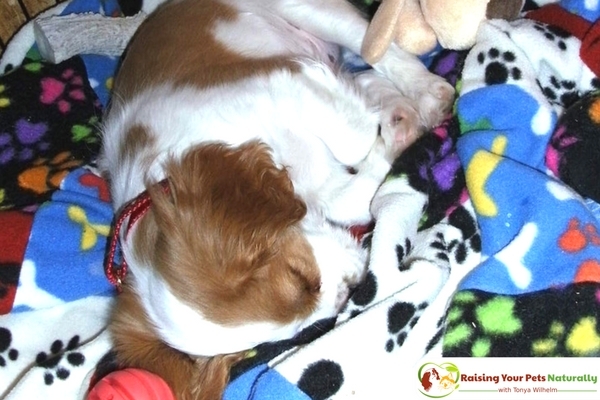 Was your puppy easy to house train? Tell me in the comments.